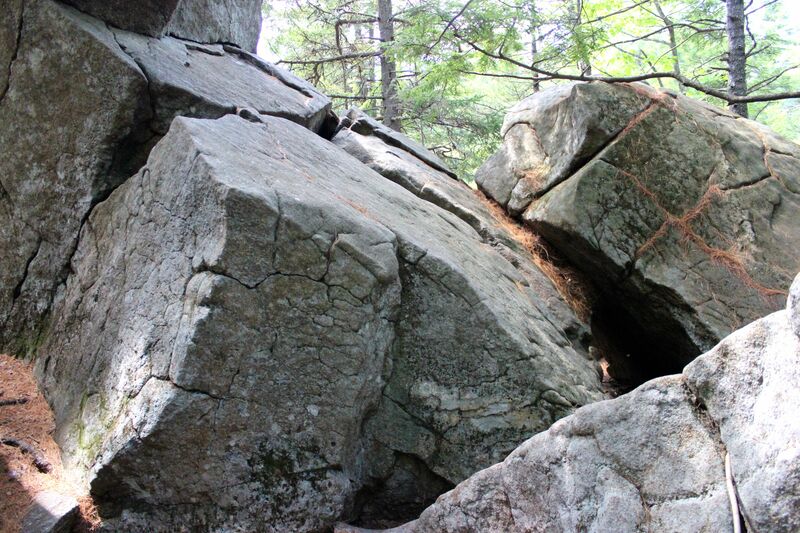 The Pequawket Indians of Fryeburg, knew the 1,100-foot mountain in Waterford as the mountain that would “tire um out” because climbing its steep side wasn’t easy. Fortunately, a much gentler trail that is only a bit steep at the start, has led to the summit of Mount Tire’m for many moons. And that was my trail of choice this afternoon. While my guys (and a girlfriend) toiled at the family business, I snuck off to the mountain to enjoy the views. 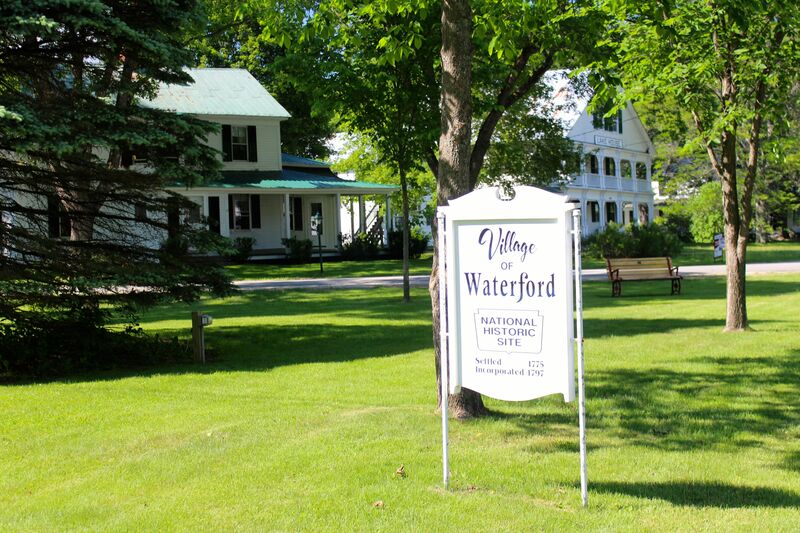 It’s located up the street from the quintessential New England village known around these parts as Waterford Flats. Think white clapboard houses, all of which are listed on the National Register of Historic Places. And a triangular green. To the right of the sign is the former Lake House, which for many years was a high-end restaurant and inn. It’s for sale now. And comes with an interesting history–in 1847, it was known as Shattuck’s Hygienic Institution, or “Maine Hygienic Institute for Ladies” and offered a water cure. Another house on the green was home to Artemus Ward, pen name of Charles Farrar Browne, a favorite author of Abraham Lincoln and Mark Twain’s mentor. Then there’s the Waterford Library designed by John Calvin Stevens and his son, John Howard Stevens. And the former town office and meeting hall–ladies sat on one side of the room facing their menfolk during town meetings and were not allowed to vote or even speak. Can you imagine? 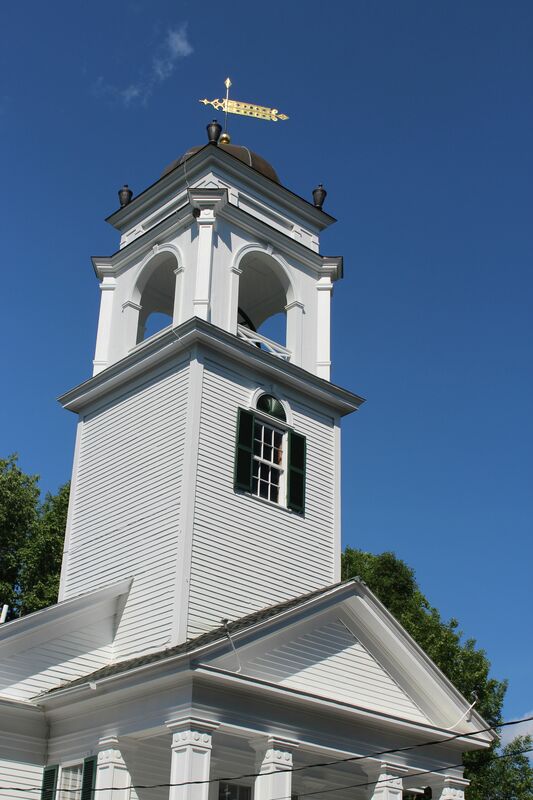 The Waterford Congregational Church was one of Stevens’ designs. It’s easy to miss the nondescript trailhead located up the road from the church. 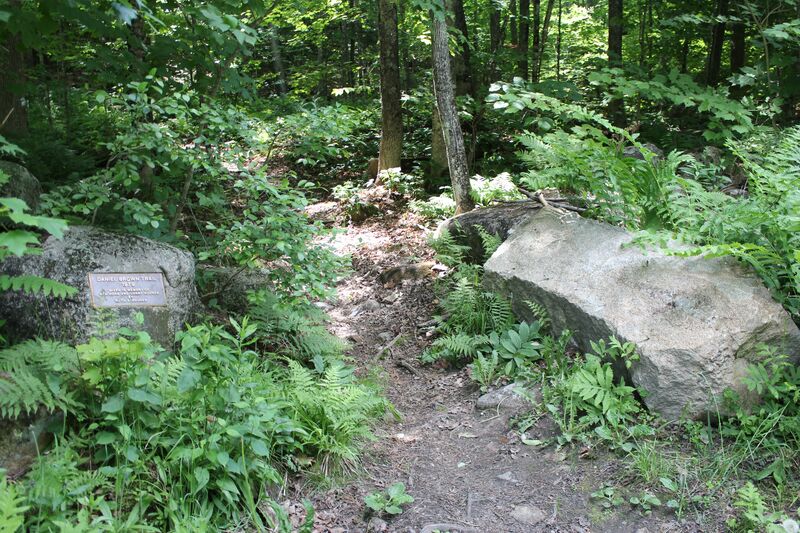 The public path that has traversed the mountain for many years was apparently known as the Old Squire Brown Trail. 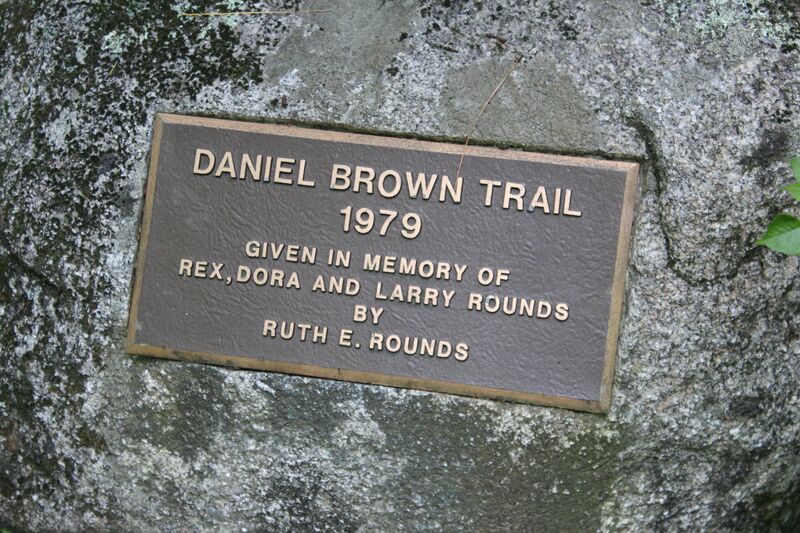 From what I gather, Daniel Brown owned a large house and farm near Bear Pond–perhaps the Lake House? He was involved in town politics and went on to serve in both houses of state legislature, becoming known as Squire Daniel Brown. 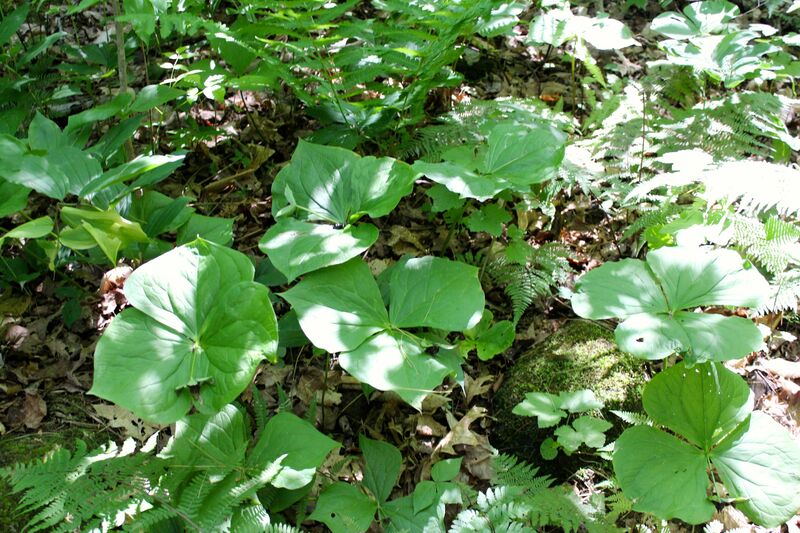 Though the flower is long past, the leaves of Red Trillium reminded me that I need to hike this trail earlier in the spring. 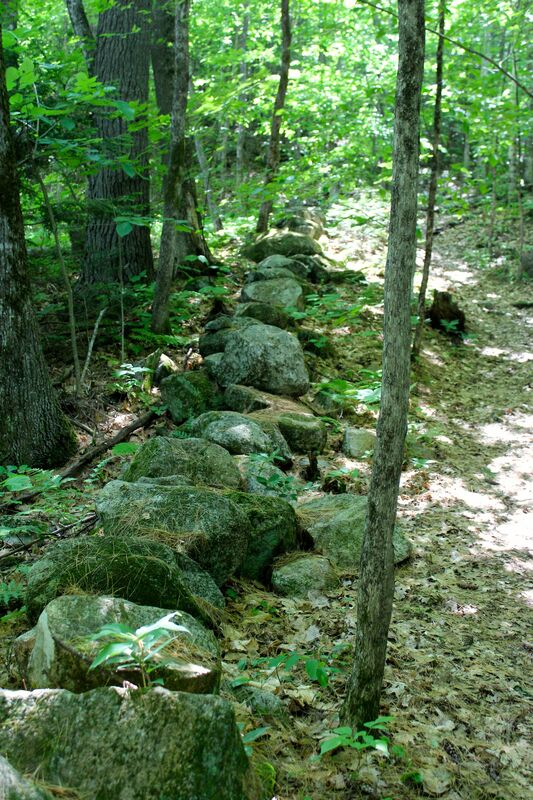 Stonewalls announce that this land was once upon a time used for agriculture. The odd leaf formation of this young ash tree made me stop. 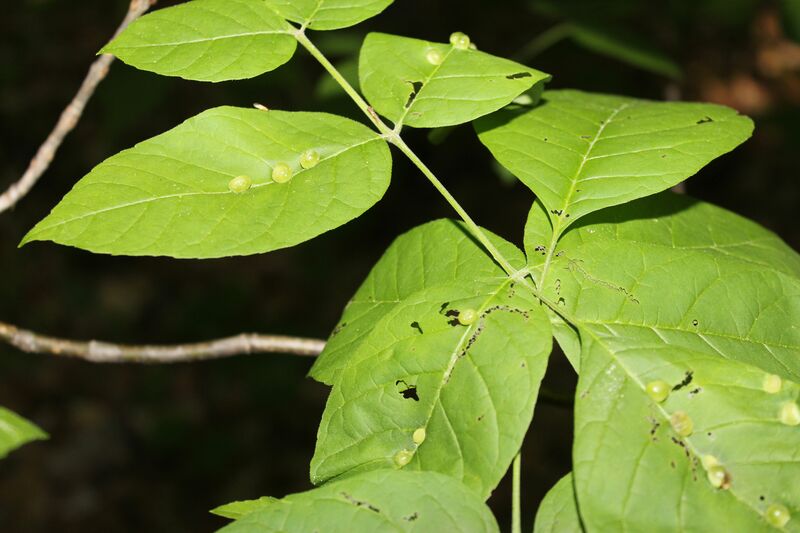 It has become host to either a fungus or insects who are using the leaves as protection while they complete their lifecycle. 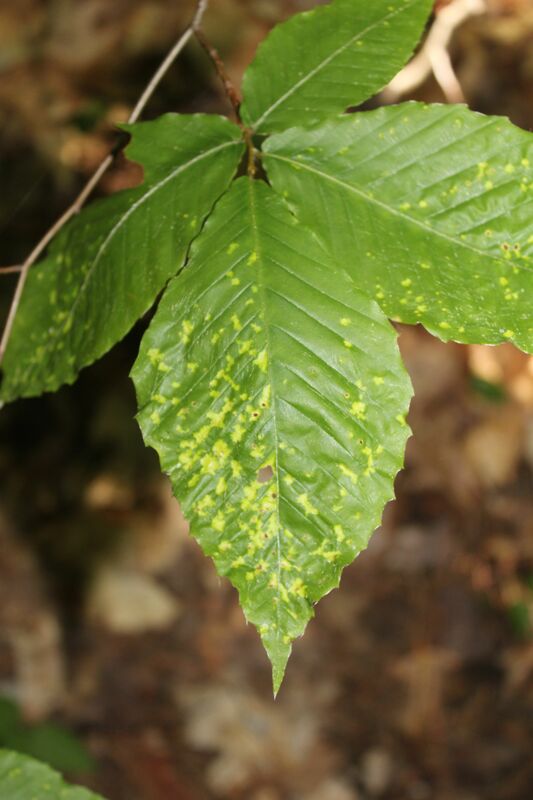 Another ash has been invaded by mites that cause the raised galls. 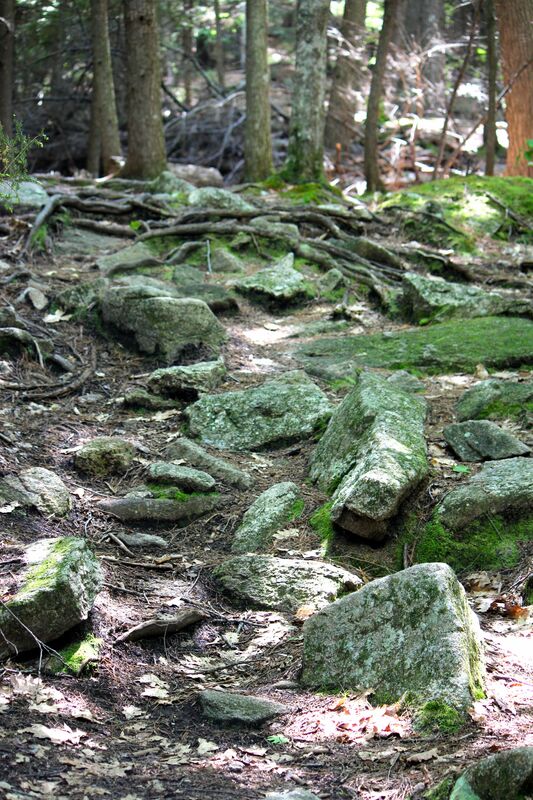 Like most trails, this one provides the rocks and roots that draw my eyes downward, so I pause frequently to look around. It’s just as well that I was alone, because not only was I taking my time, but my mind was so filled with chatter that I doubt I would have heard anyone else speak. 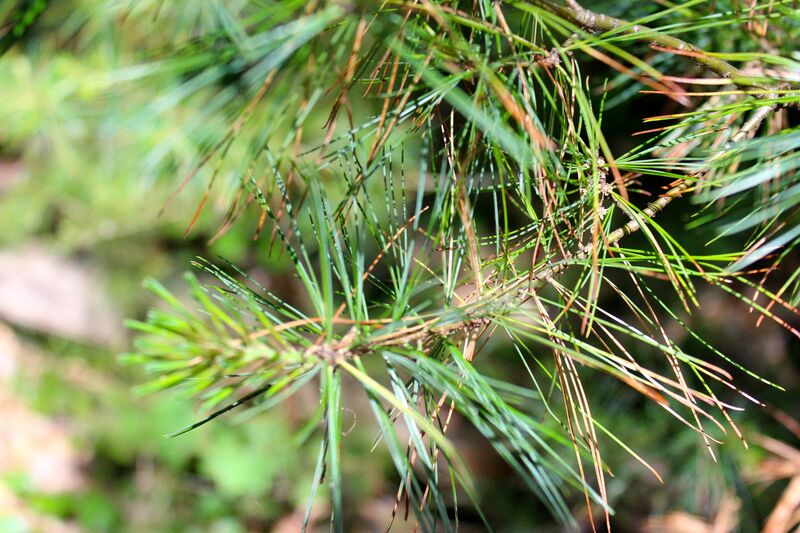 On the drive to Waterford, I’d noticed that so many of the white pines are once again suffering from the needle drop fungus. The same was true on the trail. In the newspaper, an article about climate change referred to the needle drop as occurring for only the past several years. Methinks more like ten years. 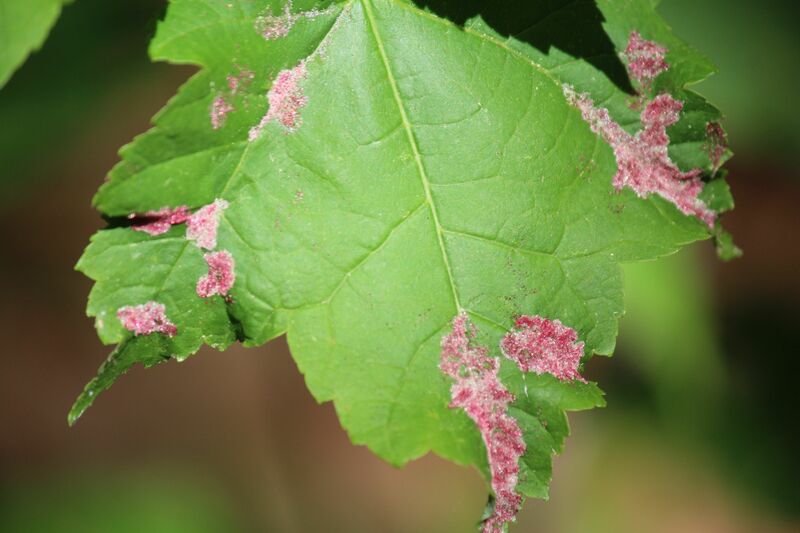 The fungus infests trees during a wet spring, such as we had last year and the resulting defoliation is seen the following year. So–I’m thinking out loud here–though we haven’t seen much rain lately, the needles are dropping because of last year’s infestation. While they look so pitiful right now, within a few weeks, they’ll finish dropping. But . 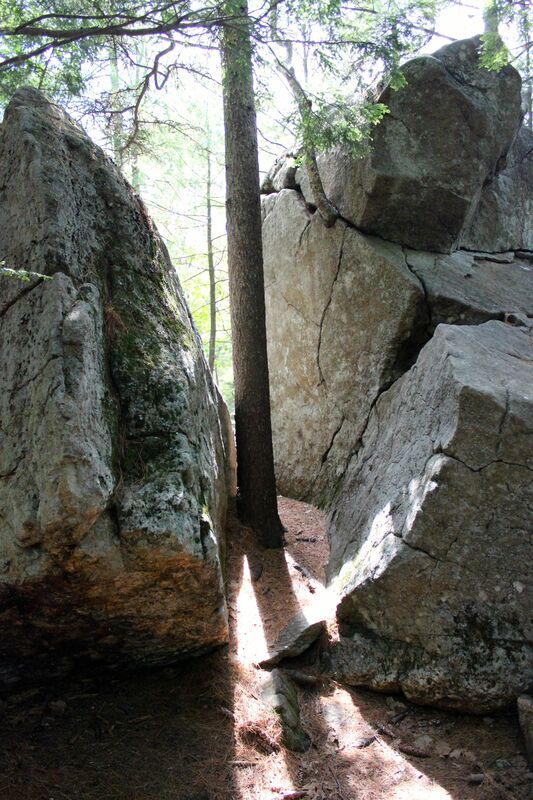 . . do the trees have the energy to survive? And what about next year? Will it be a good year for white pines? And then I think about all the pinecones the trees produced last year–it was certainly a mast year, so maybe it doesn’t affect them to such an extreme. Yeah, this was the sort of chatter I was experiencing. Some beech leaves are displaying their own relationship with a fungus. Where only weeks ago, they were the site of beauty as they opened and their hairiness kept insects and others at bay, they can’t fight off everything. Nor can we. 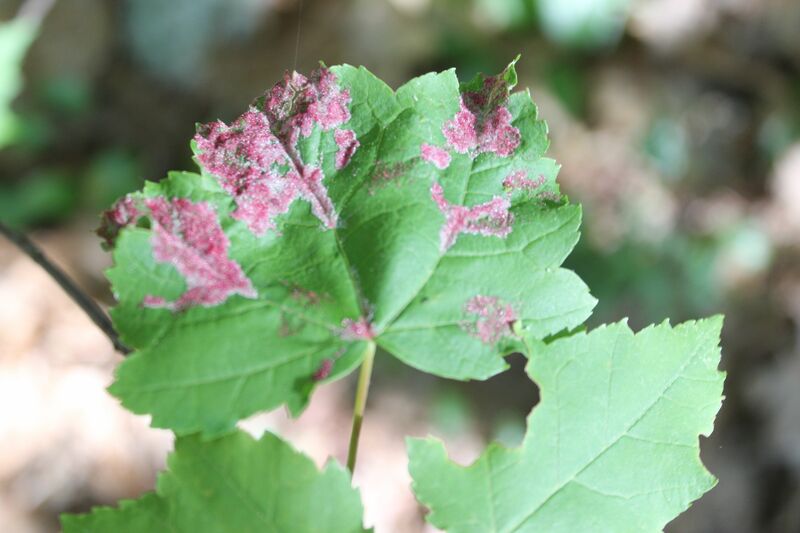 Through my hand lens, the bright pink on the Red Maple leaves has a crystal-like formation. It’s actually quite beautiful. I had no idea what caused this until I looked it up. 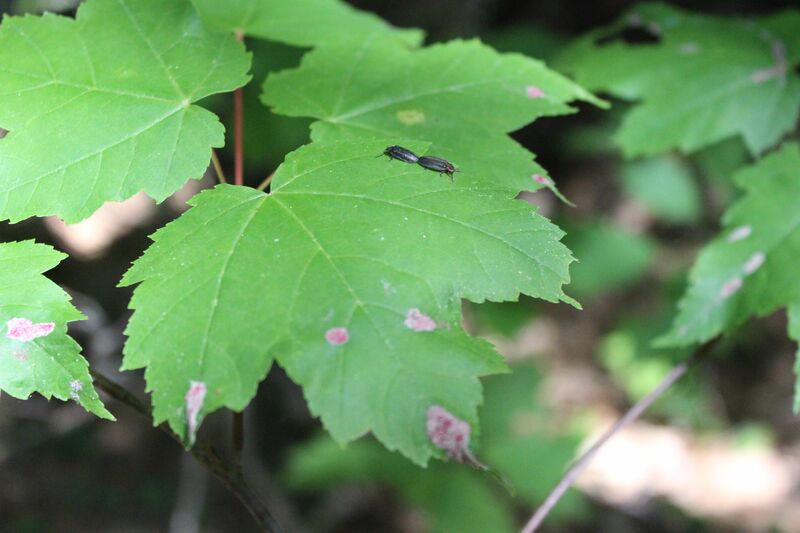 These are maple velvet erineum galls, also caused by mites. 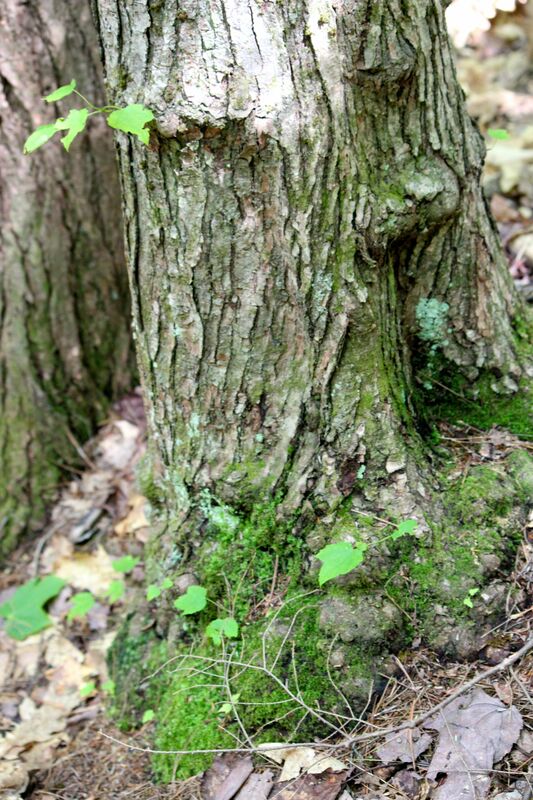 Apparently they won’t harm the tree, so they aren’t considered parasitic. It’s all a wonder to me. If you do find this, take a close look. 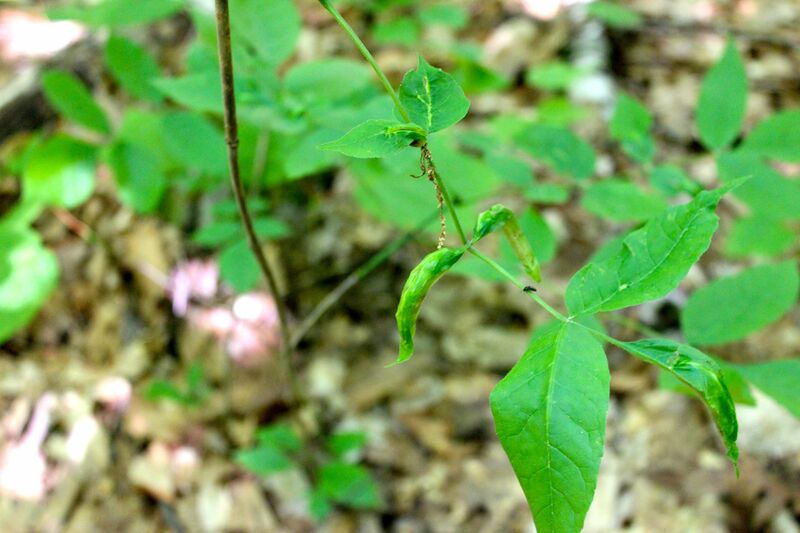 Growing up, whenever we saw spit on wildflowers and grasses, we assumed it was from snakes. A rather scientific observation. Do snakes even spit? And a foot off the ground? I’ve since learned that the foamy substance is the work of Spittlebugs. As the nymphs feed in the spring, they excrete undigested sap and pump air into it. 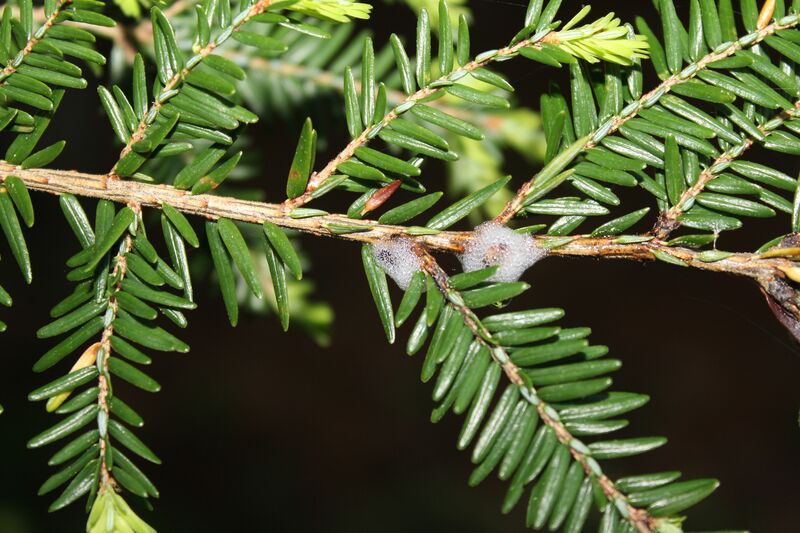 But I didn’t expect to see this on a hemlock. 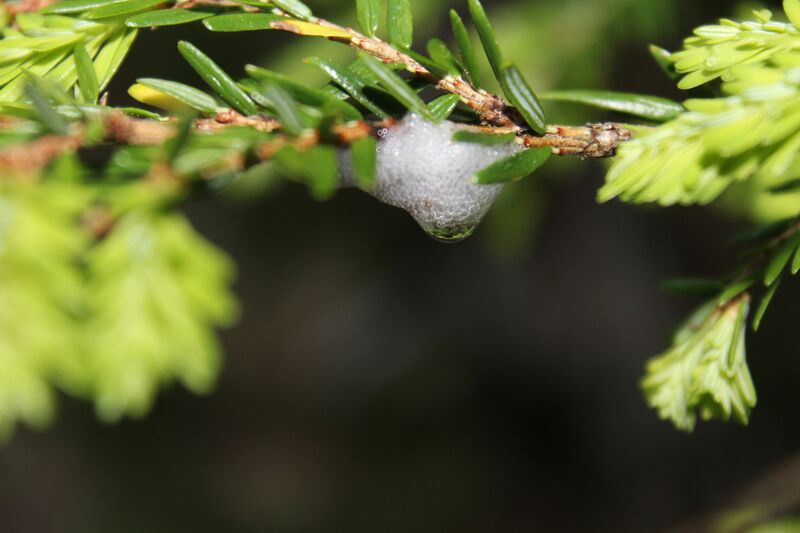 Turns out–there’s a pine Spittlebug that attacks evergreens. More reasons to keep my eyes open. Enough about hosts and fungi. It was time to take in the views. 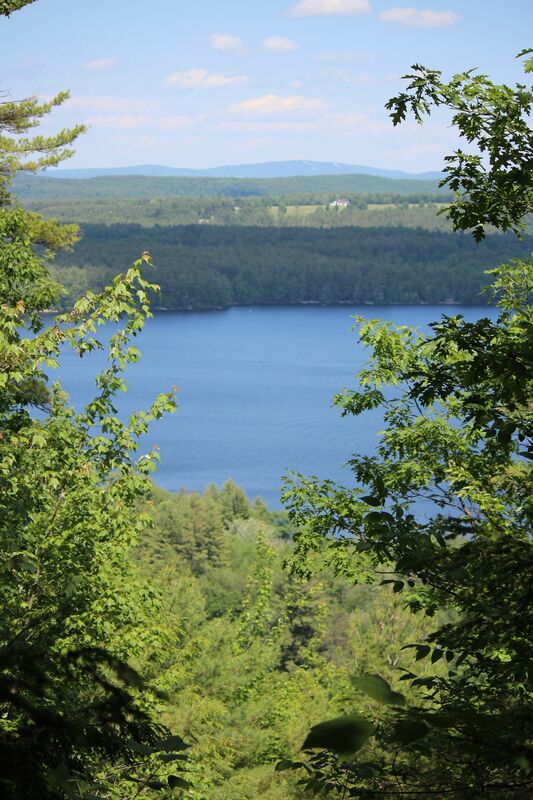 About halfway up, Keoka Lake and the Oxford Hills are visible through a cut in the trees. And finally, the summit with Pleasant Mountain in the background. 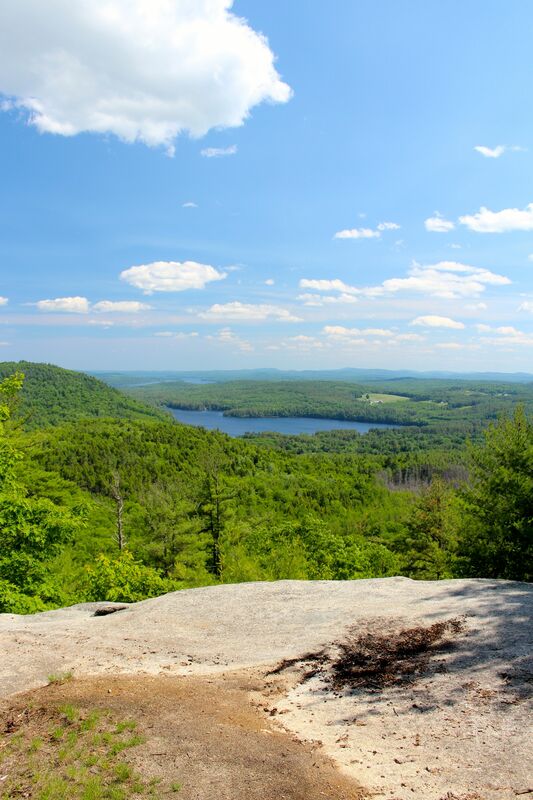 And Bear Pond and Long Lake below. 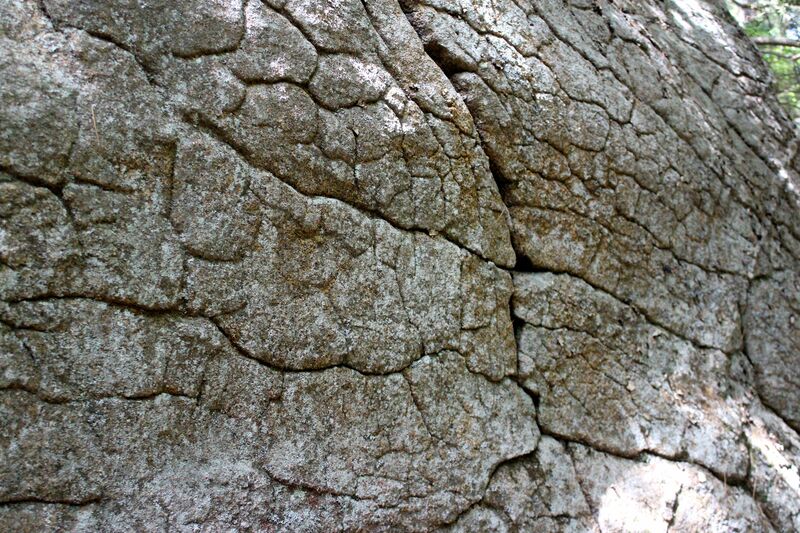 No visit is complete without a stop at the glacial erratics. Perhaps there’s more to come. As the saying goes, “so much to see, so little time.” Thanks for joining me to take in the views. Next > Slugs, Bears and Caterpillar Clubs, Oh My! 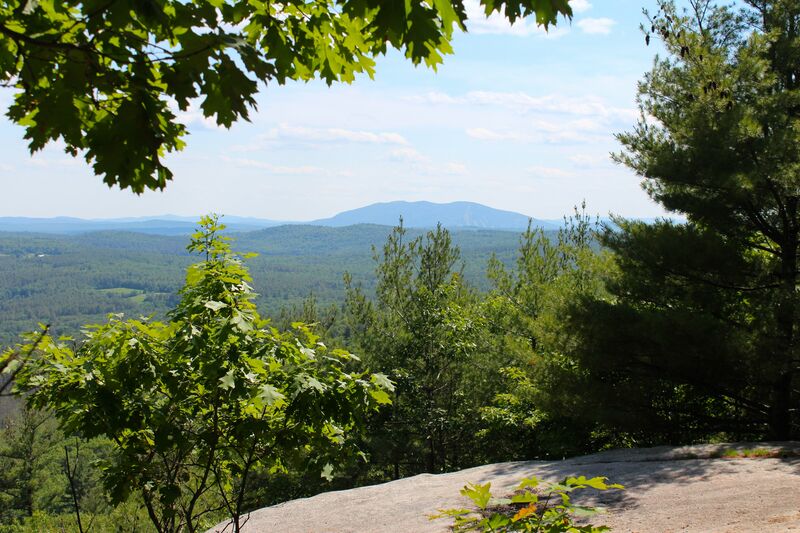 Beautiful pictures of one of our favorite trails and views. Our camp of 40 years is to the right of the view from the summit. Can you share the full size file of that picture? We live in Florida now. One of my favorite trails. Your pics are beautiful! I wasn’t aware of the storied architecture of Waterford, I’ll have to pay more attention now. 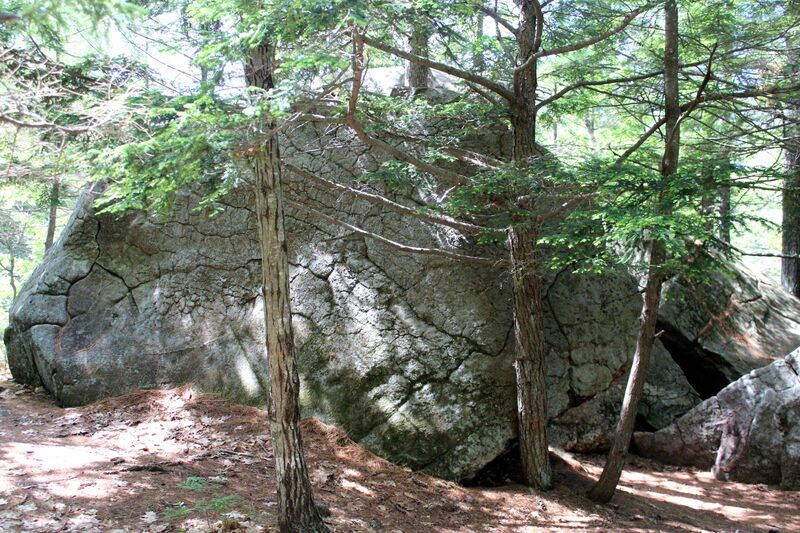 I was wondering about the white pine. The ones around our house look mighty pitiful. Here’s to their recovery! Ah, my friend, we’ll have to explore it more. As for the white pines, they struck me as being particularly bad in Waterford. Between Bridgton and North Conway, some are affected, but not to that extreme. Looking out my window right now and not too bad here.